Ever wondered what it’s like to attend a true Venetian-style party? Now’s your chance, so grab your masks, your dancing shoes, and a whole lot of energy, because it's time to indulge in one of our all-time favorite celebrations: the Carnival of Venice.Once you’ve experienced the magic that is Carnival, it’s not hard to understand why the annual event is affectionately referred to as ‘the soul of Venice.’ Attracting eager tourists from all corners of the world, Carnival offers an unforgettable experience full of elaborate dance performances, music, fashion shows, parades, and even the fanciest regatta you’ll ever see. According to local insiders at VenetoInside.com, we have two ancient traditions to thank for inspiring the Carnival of Venice: the Latin Saturnalia of ancient Rome and the Greek Dionysian cults. Deeply rooted in religion, these festivals involved masks and symbolic representations that the Venice Carnival repurposed in its own way. Both traditions emphasized freedom from social order (often through wild dancing and music), as well as a harmony between human beings and nature. The Venetian Carnival built on this theme of freedom by guaranteeing total anonymity through the wearing of masks — suddenly, aristocrats couldn’t be distinguished from the lower classes, and social divisions were equalized. However, the masks became more of an issue in the 12th century, when people started committing crimes against churches or convents under their cover. This led to an eventual ban on all Carnival costumes with the fall of the Venetian Republic in 1797. Luckily, the lively celebrations were reignited in the 1960s and have been going strong ever since. The magnificent Venice Carnival that exists today still includes many of its old traditions, particularly the theme of unity with nature and the emphasis on social freedom. The festivities officially kick off with the opening ceremony, featuring none other than a traditional Festa Veneziana on the water. Venice’s infamous Rio de Cannaregio glows as brightly lit structures designed to honor the year’s theme float across the water at nighttime. Attendees can enjoy a romantic dinner right on the canal with front row seats to the show, or join the bustling crowd along the sides, eager to get the celebrations started. For the ladies, the Festa delle Marie competition will select one winner from 12 Venetian women to receive jewels and a bridal dowry. An old tradition hailing back to the Doge era in the eighth century, the winning woman is crowned the official Marie of Carnival. She is also featured in the Flight of the Angel, one of the most popular and anticipated events of Carnival that marks the opening of the celebrations in St. Mark’s Square. Historically, the Marie is dressed as an angel, gliding all the way from the San Marco Bell Tower to St. Mark’s Square. Here, she meets the Doge — the most senior elected official in Venice. Thousands of spectators watch from below, cheering on her svolo [flight]. And how could we forget ‘Fat Thursday’? This day is dedicated to the victory of the Doge Vitale Michiel II in 1162, when he defeated the patriarch Ulrico of Aquileia and the 12 rebel feudatories. In honor of the great defeat, the successors sent a gift of one bull (symbolizing the patriarch), 12 loaves of bread and 12 pigs (symbolizing the feudatories) to the Doge. Today, this tradition is re-enacted on Fat Thursday, which lives up to its name — while the animals don’t exactly get a happy ending, the crowd always goes home with a full stomach. Whatever you do, do not forget to bring your Venetian mask to the party — it’s the best part! You can buy a traditional mask from hundreds of shops right in Venice, or even make your own on the street if you’re feeling creative. If you’re planning on attending one of the many elegant balls, such as the Tiepolo Ball at Palazzo Pisani Moretta, traditional dress and carnival masks are a must. You’ll spend the night in a classic Venetian residence from the 15th or 16th century to feel like a true Venetian aristocrat. If fancy balls aren’t your thing, you can always participate in the Best Mask Contest (but be warned — it involves a stage performance). As much as we’d love to hop on a plane and enjoy Carnival in person this year, our Mango grove needs us! 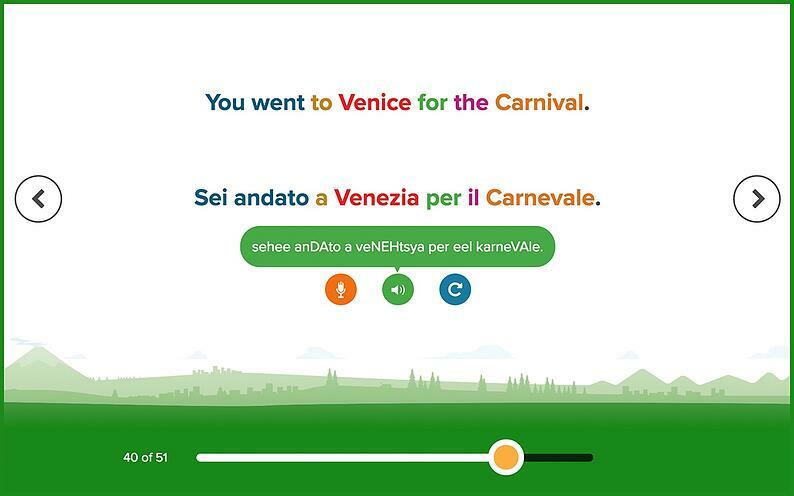 And that’s why we’ve created the next best thing: a virtual Carnival experience via language learning. 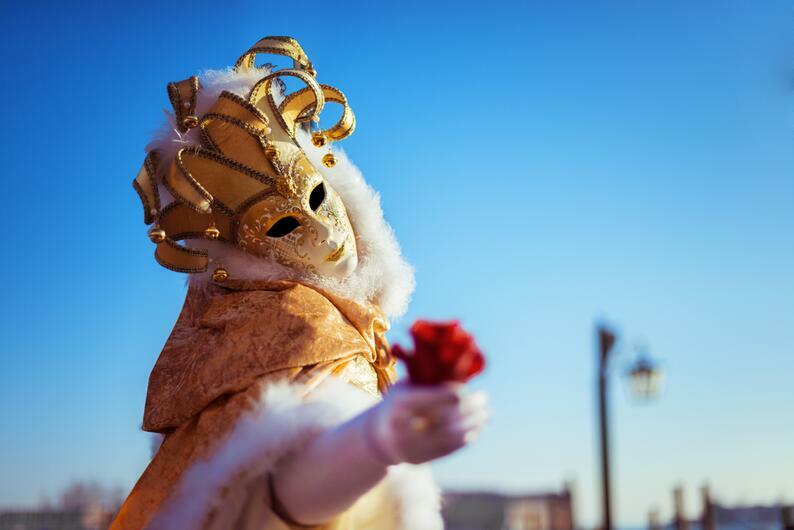 Our Carnival of Venice specialty course lets you learn Italian while escaping to Italy from the comfort of your own home, as you absorb even more of the rich history and traditions behind the Venice Carnival. 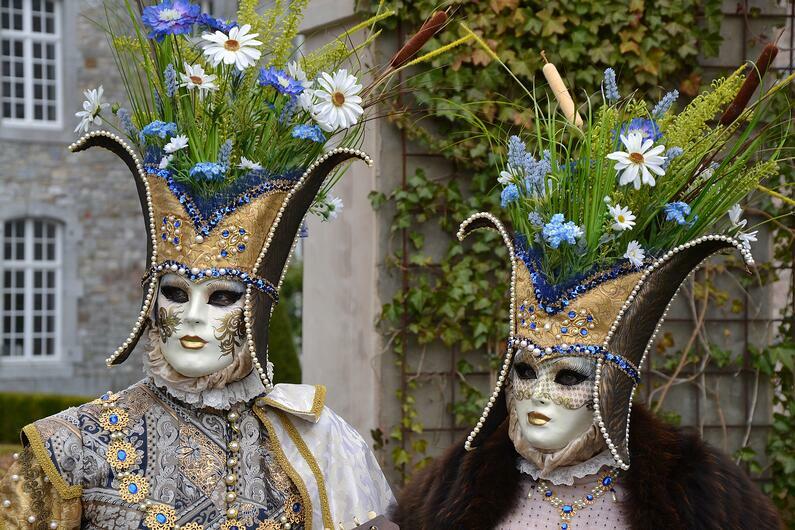 You’ll master useful Italian phrases to describe the festival, make plans with others, and even admire all of those spectacular Venetian costumes. 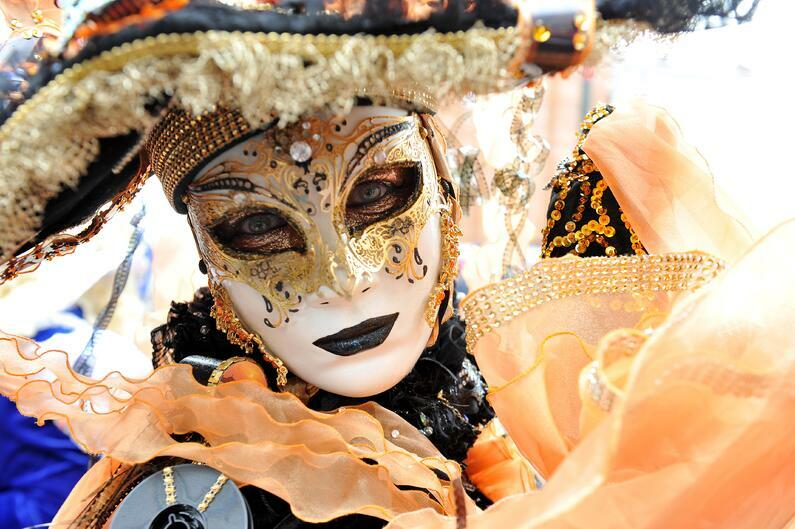 Next year, you’ll be more ready than ever to strut your stuff on the streets of Venice. 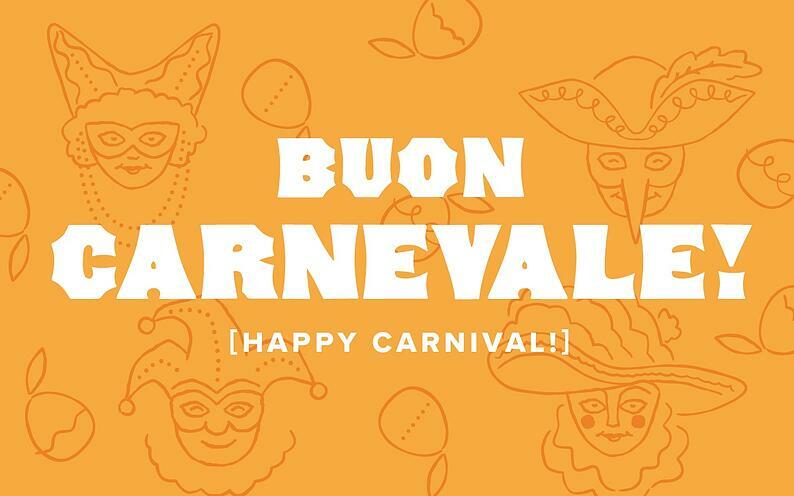 Curious about other global Carnival celebrations, or want to dabble in a different language? Choose another one of Mango’s more than 70 world language courses to explore a new culture. Click the button below to select a language, then create a profile to start your first lesson for free. Or download the Mango app for iOS or Android to take your learning on the go. What are your plans to celebrate Carnival or Mardi Gras this year? Let us know in the comments section below!